Formed around the nucleus of British saxophonist Iain Ballamy and Norwegian drummer and percussionist extraordinaire Thomas Strønen, Food once also counted trumpet player Arve Henriksen and bass player Mats Eilertsen as permanent members. The quartet debuted over twelve years ago when Ballamy joined the three Norwegian musicians for a one-off performance on stage. A self-titled album, then a second, Organic & GM Food, two years on, followed, both published on Ballamy’s short-lived Feral Records, before the quartet moved to Rune Grammofon, where they released two more albums, Veggie (2002) and Last Supper (2004), before both Henriksen and Eilertsen left, leaving Ballamy and Strønen sole in charge for the 2006 album Molecular Gastronomy. The pair regularly perform with additional contributors, and it is two of these occasions that have been captured for Quiet Inlet, Food’s sixth album, and their first for ECM. Built around live recordings made at Oslo’s legendary Blå club in 2007 and at the Molde Festival in 2008, Quiet Inlet sees Food joined by Austrian experimental guitarist Christian Fennesz and Norwegian trumpet player Nils Petter Molvær, the former contributing to three tracks (Tobiko, Mictyris and Fathom), the latter to four (Chimaera, Becalmed, Cirrina and Dweller). 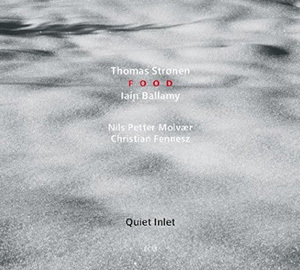 Like with every Food release until now, Quiet Inlet is a highly textural and atmospheric record, focussed primarily on Strønen’s exquisite percussive displays and gentle electronics, which serves as a stunning backdrop for Ballamy’s evocative melodic motifs, in turn on tenor and soprano sax. It is perhaps Molvær’s contribution which is most immediately apparent here as he weaves his own improvisations around Ballamy’s, evoking for a moment Food of years past as the warm glow of the trumpet circles around the softer sound of the soprano sax on Chimaera and Cirrina. On the introspective Becalmed, the pair enter into a fascinating dialogue, both players stepping out in turn at first, then echoing each other’s lines in the second half of the piece. Fennesz remains a more discreet presence on the three tracks he is featured on, his often visceral live noise processing kept well under wrapped here as he favours instead discreet brushes of treated guitars on Mictyris and Fathom, creating wonderfully ethereal moments, especially on the latter, and adds fragments of gritty electronics on album opener Tobiko, which is swept by a powerful wind in its later part, growing increasingly cold and piercing as Strønen’s drumming becomes more defined and assertive. This ECM debut finds Food in fine form, Ballamy and Strønen effortlessly continuing to reinvent their sound while retaining the principles that have, until now, served them well. Strønen does here what he does best, providing the backbone for these improvisations to flourish, with Fennesz adding some interesting textures to the duo’s natural environment, and it is a pleasure to hear Iain Ballamy once again battling it out with a trumpet player, and he finds in Nils Petter Molvær an inspired companion.